Little Kids Rock, a non-profit organization that truly understands the importance of music education in every child’s life, is one of the leading providers of free music lessons and instruments to underprivileged children in US public schools. Little Kids Rock provides 1,177 children in San Francisco alone and also reaches out to 150 kids in Sonoma County as well as children in disadvantaged public schools throughout the Bay Area. 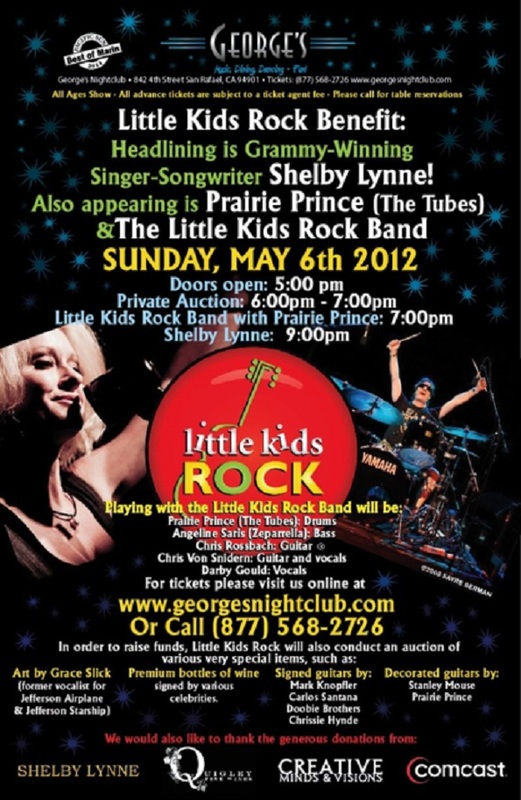 To help keep the beat of music education thumping, Little Kids Rock will be having a benefit on May 6th at George’s Nightclub in San Rafael, CA. This is not just any benefit. Along with Grammy-winning, singer-songwriter Shelby Lynne headlining the event, not one, but two Little Kids Rock Bands (accompanied by Prairie Prince of The Tubes) are kicking the evening off with some rock ‘n roll. These kids are super excited to rock out songs like “Boulevard of Broken Dreams” by Green Day, “Should I Stay or Should I Go?” by The Clash, “La Bamba,” some original songs, and more. Along with the music comes a chance to take home some special rock ‘n roll items from the Little Kids Rock auction. There are guitars signed by Mark Knopfler, Carlos Santana, the Doobie Brothers, and Chrissie Hynde as well as two decorated guitars – one decorated by Stanley Mouse and the other by Prairie Prince. There will also be some art by Grace Slick up for auction, among other items. Get ready to rock on May 6th and help keep music a necessity in all children’s lives. This is an all ages event. For more information and tickets, visit here.